I found this recipe for PORK BRAISED IN COCONUT WATER in a Cuisine magazine (from New Zealand). It’s good to feed 8 people. It’s quite simple to make and the flavour is amazing. You need a bit of time for cooking it so start early. Char the ginger and shallots on a naked flame, turning until blackened. Alternatively, put on a baking tray then grill in the oven until blackened. Peel and discard the skins then coarsely chop the ginger and shallots. In a big saucepan, put the ginger and shallots with the coconut water, spices, garlic, sugar and 150ml fish sauce. Add the pork, ensuring it’s fully submerged. Cover with a circle of baking paper, place over high heat and bring to the boil. Reduce the heat to medium-low, cover and simmer for 1 ½ – 2 hours or until the pork is tender and falling apart. Strain the liquid through a sieve, discarding the solids, then return the liquid to the pan and set over high heat. Boil for about 30 minutes to reduce to 750ml (3 cups), then add more fish sauce to taste. Pull the pork apart into small pieces then return to the pan withy the liquid over very low heat and keep warm. To serve, blanch the rice noodles according to the packet directions. Drain and, if using sheets, tear into large pieces. 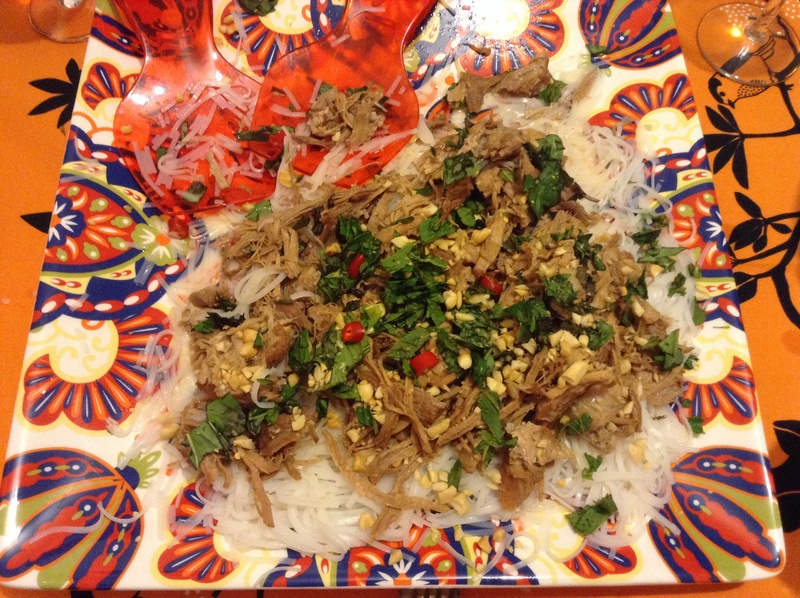 Put the noodles on a platter, top with the pork meat and sauce, and garnish with the herbs, chillies and peanuts. – I bought pork shoulder rolled and tied. I took off the ties and cut off the fat, then cut 4 pieces of meat. I also got a bit more than 2kg of meat to make up for the loss of the fat. – I used rice noodles, not sheets. I put them in a big bowl, added boiling water and let it sit covered until the noodles were tender. I didn’t used 1kg, it seemed quite a lot. – I don’t usually eat raw chillies, but they gave colour to the dish and it gave a bit of a kick.